Griffin Technology has released a brand new case for the iPod touch 2G called the Wave. "The distinctive wave shape on the case defines elegant styling as well as unique functionality. Wave's overlapping curves of the closure provide increased surface area to lock together with greater security for your iPod. Your iPod is enclosed at all corners in translucent, durable polycarbonate. Included screen protector guards your screen, but allows complete access to your iPod clickwheel. Wave for iPod touch (2nd generation) includes protection for your multi-touch display." 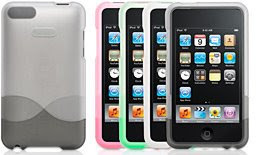 The Griffin Wave iPod touch 2G case is available in 4 colors: pink, white, green, and black; and the price is $24.99. You could also get two-packs of the Wave (black & green or black & white) for $35. The product is now available on Griffin Technology.